What in the world are phrasal verbs? We use phrasal verbs a lot, but many people don't know what they are. Do you? 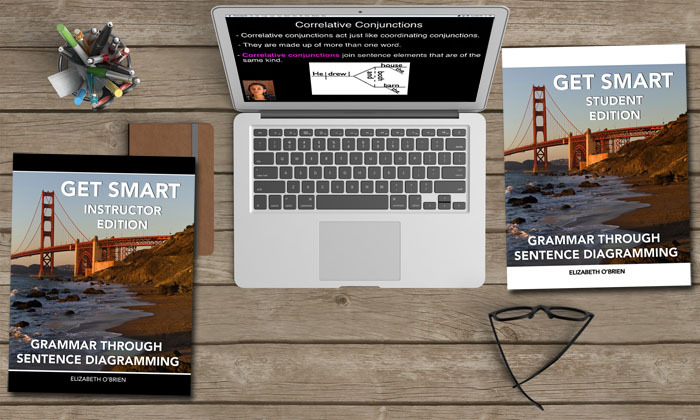 The words work together to perform the job of one verb, and they create a meaning different from the meaning that the words have by themselves. Their name might remind some of you of verb phrases, but they aren't the same thing. He dressed up for the concert. We were tired, and we turned in early. I work out in the morning. I often look up words in the dictionary. I hope he shows up on time. We ran into my neighbor at the park. Alice likes to horse around. 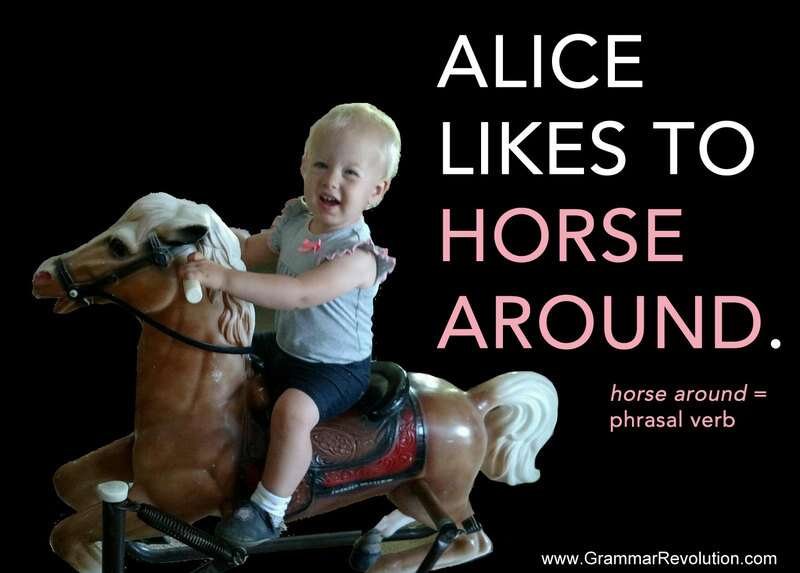 Psst… Horse around is also an idiom. Let's take a closer look at three of those example sentences. We'll also look at how to diagram them! If you're new to diagramming sentences, don't fret. Diagrams give us a way to SHOW the structure of sentences. 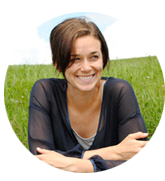 If you want to learn more about diagramming, this page will help. Dress up contains two words that are performing the job of one verb. 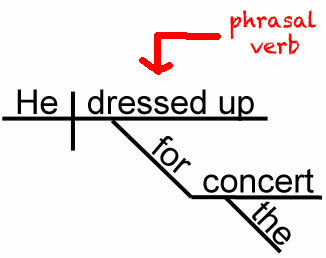 Dress is a verb, and up is a word from the preposition list. Dress up has a different meaning than the words have individually. Dress up means to wear nice clothing. 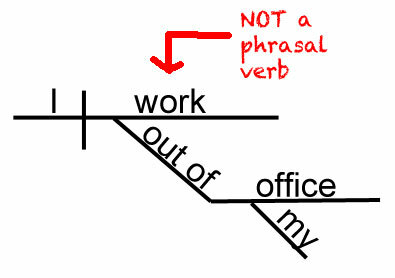 Since phrasal verbs are functioning as one verb, you diagram them just like you would diagram any other verb. That means you don't have to do anything fancy. Work out contains two words that are performing the job of one verb. Work is a verb, and out is a word from the preposition list. Work out means to exercise. Turned in contains two words that are performing the job of one verb. 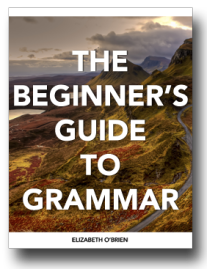 Turned is a verb, and in is a word from the preposition list. Turned in means to go to sleep. These word combinations don't always create phrasal verbs. These only occur when the words combine to create an entirely new meaning. Let's study this phenomenon with the words work out. We saw above that the words work out can create a phrasal verb. But, that is not always the case. Look at the next sentence. I work out of my office. In this sentence, work out is not a phrasal verb. Work is a verb, and out is working together with of to form a preposition. 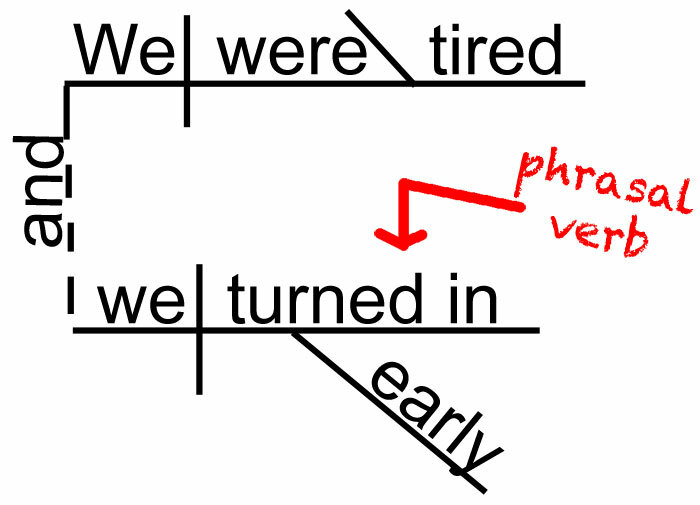 You can see from the diagrams that one sentence contains a phrasal verb and one does not.